“I have a piece of paper that I’ve kept for more than twenty years. On it are two questions. ‘What do you want?‘ and ‘What are you willing to do to get it?’” said Sylvia Ferrell-Jones, President and CEO of the YWCA of Boston. Ms. Ferrell-Jones is a community leader who is advancing Greater Boston’s understanding of social justice and change. She and I happened to be guests at a dinner party of a mutual friend. Her comments emerged during a discussion among attendees about her organization’s goals: to serve Boston’s neighborhoods where health, education and safety inequities are most significant. It is against these formidable challenges that she measures progress. My plan this week was to talk about, “Action Trumps Everything: Creating What You Want in an Uncertain World,” by Len Schlesinger and Charles Kiefer with Paul Brown. In the moment that Sylvia shared with us her view of action as a critical change tool I was struck by how many similarities there are across the broad genre of change — not just change related to transition or social justice. I’ve posted about Len Schlesinger in the past. He is the president of Babson College and also a veteran business leader. In writing their book Schlesinger and his co-authors leveraged research on entrepreneurship that was recently conducted by Babson. Not entirely altruistic since Babson is known for its teaching in this arena. The book is a quick read. If entrepreneurship is one of your interests the book offers quite a bit more than the ‘loop‘ above. Near its conclusion Schlesinger and friends offer a chapter entitled, “How entrepreneurial thought and action can change the world.” (Action Trumps Everything, Schlesinger, et al, pg 137+) They suggest that any problem, even big amorphous ones whose outcomes are unpredictable, can benefit from this action loop. I wonder about the implications of this loop for transition. I’m all for experiments that lead to testing and re-testing new paths. Thank you Herminia Ibarra and her experiments in Working Identity. Over the course of my career I feel as if I’ve tested hundreds of paths. To my benefit I might add…. That said I’m afraid of what I describe as the Tasmanian devil syndrome, think Looney Tunes not the ferocious animal found off the coast of Australia. Let me say more about this view. In the cartoon the Tasmanian devil spun around very fast but never covered much ground. All velocity but little forward progress. See my fear? Action for action’s sake can have its risks. Remember Eleanor Roosevelt’s words, “women should be able to realize that making up our minds as to what gives us the greatest amount of pleasure and then working for it, is one of the (great) satisfactions of life. Drifting along is too easy to do.” (It’s Up to the Women, 1934 Eleanor Roosevelt) I’m all for action during transition related to investigating, hypothesizing, realizing, and refining. It’s the other side that worries me. Months can slip by with distractions posing as priorities. At dinner after Sylvia shared her two questions another woman shared a story about a friend who survived breast cancer. The story was really about the action that swirled around this woman during her fight. The short of it is that the ladies mobilized around her: visits; appointment shuttling; dinners prepared and dropped off. I couldn’t help but think that women are masters at mobilizing in countless acute situations. I’d give us lower grades on the requirements to act purposely along a personal trajectory over the long haul. If you could take just one action, do you know what it would be? Any guess at what you might learn? I guess I could send Len Schlesinger’s book to Sylvia or shoot Mr. Schlesinger a copy of Sylvia’s trusty 2 question note. Both are actions. Do you see my concern? 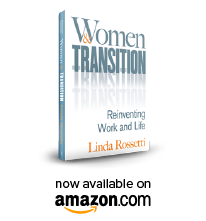 This entry was posted in "Transition" Book Reviews, Observations on Transition and tagged Action Trumps Everything, career transition issues, Eleanor Roosevelt, Herminia Ibarra, It's Up to the Women, Len Schlesinger, observations from a women's transition, personal transition, Sylvia Ferrell-Jones, women's transition issues, women's transition process, Working Identity, YWCA Boston. Bookmark the permalink. A few thoughts on steps b and c in the loop cited in your post [(b) take a small step towards obtaining it; (c) stop and think]: I find it is often more comfortable to take action that FEELS like action – it has a “doing” component to it. I have more trouble with the “thinking” piece even though action (my brain working) is required. Until I make myself STOP “doing” it is difficult for me to get to the important action of “thinking”.